Scanning a computer system for duplicate files regularly can be beneficial in several ways. It can help save disk space and avoid confusion when working with the similar file that resides in multiple locations. Some systems on the other hand provide better success rates when scanning for duplicate files. Especially those that download lots of multimedia files like photos, images, audio files and videos as these are often downloaded without checking if some of the files are already on the system (maybe under a different name). 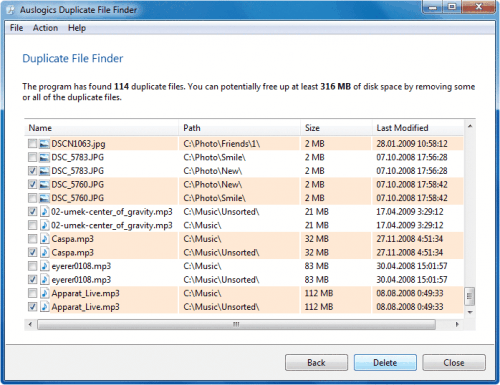 The Duplicate File Finder by software developer Auslogic is one of the duplicate file finders available for the Windows operating system. The interface has been designed with ease of use in mind. It begins by selecting folders or hard drives that should be checked for duplicates. It is possible to select multiple folders and drives or just one. The options of the duplicate file scan are configured in the next screen once the folder and drive selection has been made. The options are divided in the three categories matching criteria, advanced criteria and file types. Matching criteria defines the aspects of the files that should be matched with each other. These are the name, date and time and size by default with the option to add contents as well (resulting in a slower scan) or remove one of the other criteria. Advanced criteria can be used to filter out files with a size lower than the size specified in this section of the configuration. File types finally makes it possible to only scan specific file types or all files in the selected folders. A list of results is then displayed after the program finished the scan. File names, sizes, locations and last modified dates are displayed with the option to select some or all of the files so that they can be deleted. 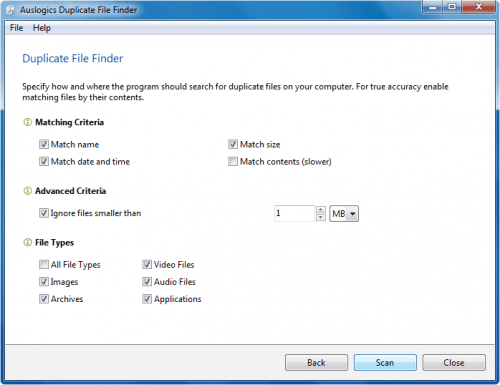 The Duplicate File Finder can be downloaded from the Auslogics website. Looks quite nice… What’s the system resource usage like when scanning for dupes? I’ve been using DoubleKiller for this purpose, but it takes an age to scan large disks, and my system seems markedly less responsive until the scanning ends. What’s the system resource usage like when scanning for dupes? I’ve been using Duplicate Finder 2009 for this purpose. it has more option and is quite faster.